The XXL complex (XLF-Cernunnos/XRCC4/DNA Ligase 4) is the limiting component of the NHEJ reaction. We have undertaken a conjunction of biophysical and biological approaches to target the ligation complex in cellular radiosensitization strategies. 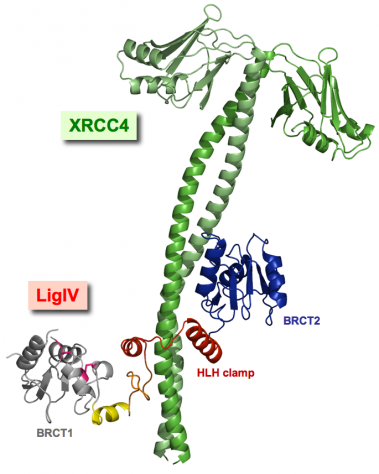 The strong interaction between XRCC4 and DNA Ligase 4 is essential for DSBs repair by NHEJ. A virtual screening campaign on the DNA-Ligase 4 clamp domain was carried out. A validation of the target-ligand interaction was carried out by different biophysical techniques including NMR. Thus, we have isolated a molecule able to prevent the interaction between XRCC4/Ligase 4 in an interaction biochemical test. This result established for the first time the accessibility of this interface to pharmacological targeting (Menchon et al., 2016). 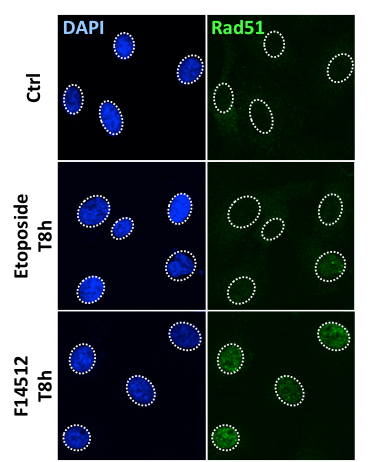 The new anticancer molecule F14512 was developed by Pierre Fabre Laboratories (PFL) from etoposide (ETP), a topoisomerase II inhibitor causing DSBs. F14512 shows enhanced toxicity as compared to ETP and underwent phase II clinical evaluation. A formal collaboration was initiated between PFL and our team to determine the molecular action mechanisms underlying the high toxicity of F14512. We discovered that, in contrast to most DSB induced by ETP, F14512-induced DSBs are repaired more slowly through BRCA1-dependent HR. Our findings support the use of F14512 to treat cancer with deficiencies in HR such as BRCA1/BRCA2-deficient breast and ovarian cancers (Bombarde et al, 2017).